Pope Francis described the leaven of the Pharisees as the leaven of hypocrisy which allows self-centeredness to grow. This leaven applies to people who think only of appearances, he said. Should they meet someone in difficulty along their path, they turn their gaze away. 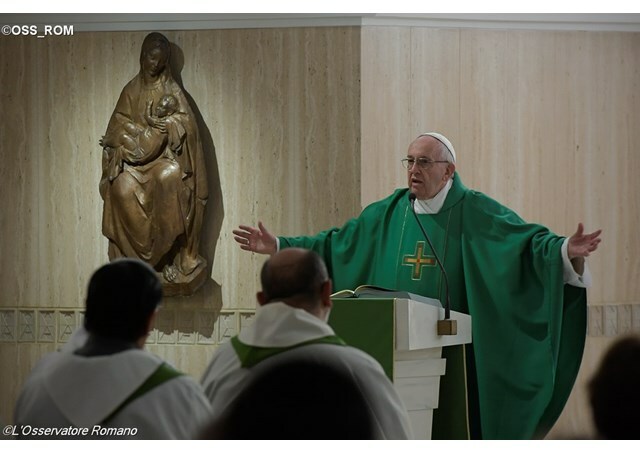 “Jesus says that this leaven is dangerous” because it has no future, the Pope said. The other type of leaven, which has the opposite effect, is that of the Holy Spirit. Turning to the First Reading from the Letter to the Ephesians, Pope Francis explained that the leaven of the Spirit is given to those who have been “sealed by the Spirit”. The Spirit, he said, is the pledge of the inheritance while Christians await “complete redemption”. Jesus himself wants Christians to “journey continually with the Holy Spirit’s leaven” toward the horizon, Pope Francis said. Because Christians possess the pledge of the inheritance, they then reach out toward those in difficulty, the suffering, the fallen, in the hope of “finding the inheritance”.